Armenian opposition leader Raffi Hovannisian, who has unsuccessfully disputed the reelection of President Serzh Sargsyan in the past seven weeks, has pledged to continue his struggle against what he described as a ‘false’ government as he addressed supporters at another rally in Yerevan on Friday. 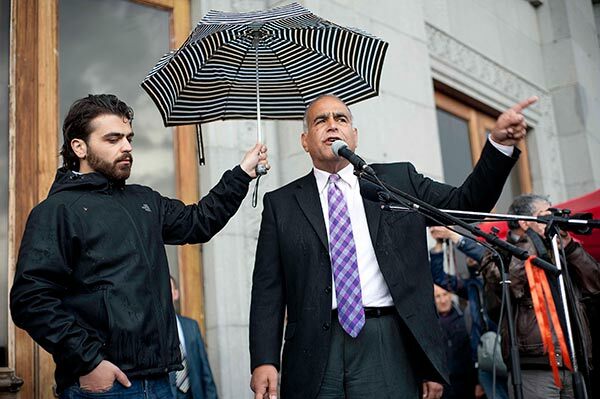 Two to three thousand people braved heavy rain and defied political pundits’ predictions of a dramatic fall in attendance at Hovannisian’s rallies to turn out for what was the first opposition gathering in Liberty Square since the day of ‘dueling inaugurations’ on April 9. That day, when President Sargsyan was officially sworn in for a second term and Hovannisian and his supporters took an oath in the square to fight for a ‘new Armenia’, ended in clashes with riot police after protesters led by the opposition leader attempted to stage a march past the presidential compound on Baghramyan Avenue. About 10,000 people had turned out for the April 9 protests, but crowds then also included thousands of people coming from provinces to join the demonstrations. In his remarks tonight Hovannisian repeated that he will not recognize the “false” oath of presidency given by Sargsyan and his ‘illegitimate’ government. “In the coming weeks and months we will not give rest to this government and will continue our struggle in Yerevan and other cities and towns,” said the opposition leader. He emphasized, however, that he was against bloodshed and would continue his struggle using peaceful means only. Hovannisian, his wife Armine and son Garin were in the first row of protesters marching towards Baghramyan Avenue on Tuesday. Both he and his wife were among those who were strong-armed by security personnel in the standoff in which another opposition member Armen Martirosyan was beaten by ‘red beret’ police and suffered a broken nose. Addressing his supporters Hovannisian condemned the violence and criticized several major political parties, including the Prosperous Armenia Party, Dashnaktsutyun and the Armenian National Congress, for not being “next to the people” on April 9 despite their lofty declarations to this effect. He also accused the government forces of introducing ‘provocateurs’ into the ranks of protesters for the purpose of instigating clashes with police. Still, in his speech Hovannisian again called on all political and civil forces opposed to the government to join their efforts for a broad-based movement that he said should stand above party policies and affiliations. He announced that an indoor meeting of such forces willing to institutionalize their struggle will be held next Friday. Hovannisian did not speak about his one-day trip to the Russian capital of Moscow on Thursday where he reportedly met with at least one Kremlin official. He reiterated, however, that the “victory of the Armenian people” must be recognized by all world power centers, be it Moscow, Brussels or Washington.